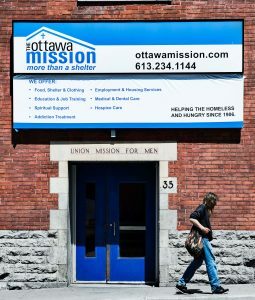 This Fall, we’re lining up interesting speakers for a series of talks and discussions about different aspects of The Ottawa Mission services, as well as the issue of homelessness itself. Please join us on Monday, November 27th in The Mission’s dining room for the last session of our Fall Speakers Series. Learn more about mental health supports for people who are homeless from Tony Clunis, R.N. and Hillary Jocelyn – both part of the Royal Ottawa Hospital Outreach team. They will discuss their role in connecting with people at The Ottawa Mission and other shelters in the community. Everyone is welcome! The Mission Speaker Series breaks for the Christmas season and will resume Monday, January 22nd – details coming soon.